Misinforming the middle classes about heritage theft. Discretion? Confidentiality? Pourquoi? Who outside metal detecting (and Britain) would deny that secrecy has absolutely no place in metal detecting or that British artefact dealers are (unwittingly) making it easy for a few British looters and far, far more British legal knowledge thieves to do what they do? Wouldn’t it be nice if Glasgow University and The Guardian got it into their heads that what is happening here in Britain is massive, blatant ongoing theft of British cultural knowledge by thousands of British citizens and that it stinks – and to write some articles telling the educated middle classes about it accordingly? While I’m here ranting about cultural damage and lack of official action against it: this posted on a detecting forum yesterday, really, really annoyed me. (Why should anyone care what annoys the likes of me? No reason at all except one: I am right, and I’m only expressing what The Archaeological Establishment knows is true but won’t express!). It vividly illustrates how knowledge loss works and that it is at a far higher level than anyone except a few unofficial complainants bother to work out or fret over. It is a visible manifestation of a simple but universal truth – a damaging all-British algorithm – namely that the more important it is not to metal detect a field, the keener are the unthinking or uncaring history-botherers to detect it. (For the avoidance of doubt, mostly legally – but that’s the shameful thing about Britain). Scale that simple truth up and it implies that the knowledge loss inflicted by the laissez faire hobby is massively greater than a “random” choice of target fields is commonly assumed to produce. In fact, not merely massively greater but almost incalculably greater., utterly tragic for Britain and completely unacknowledged by those who should be loudly condemning it. Ah well, he’s talking unkind talk again, carry on chaps. The depletion is invisible so it’s not worth standing up against it. This really does come across as one mans rant (as you admit) as opposed to a more reasoned presentation of the wider accepted opinion of society in general. “Francis”, are you suggesting that people in general are NOT interested in the despoiling of the precious remains of past by selfish people out to make a few quid? I rather thought the educated folk of England, at least, cared about the historical environment around them. 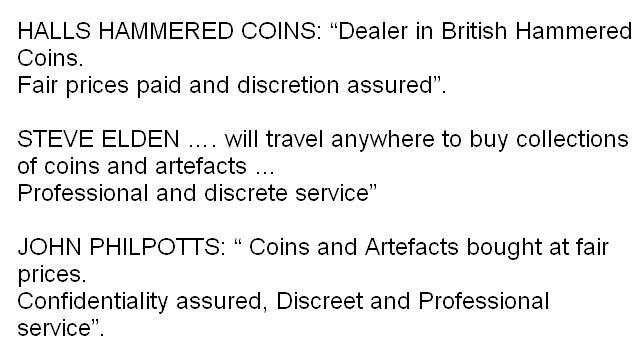 What does it mean “discretion assured” when buying from artefact hunters? The whole ethos of Responsible Detecting is transparency, reporting things, not hiding them. We are asked to applaud Responsible Detecting, the ones that reported, condemn the nasties. Can you do that? That is what the Portable Antiquities Scheme in its heyday spent Millions of Pounds on making the “widely accepted opinion of society in general”, would you say it had failed in that? All those millions of pounds? « More news from the Undemocratic Repugnate of Shropshireland!